Building on the success of the ground-breaking Vizi BSW 300, the new PLSN Magazine Gold Star Product Award winner for ‘Best New Club Light,’ Vizi CMY300, is ADJ’s most advanced LED-powered moving head to date. 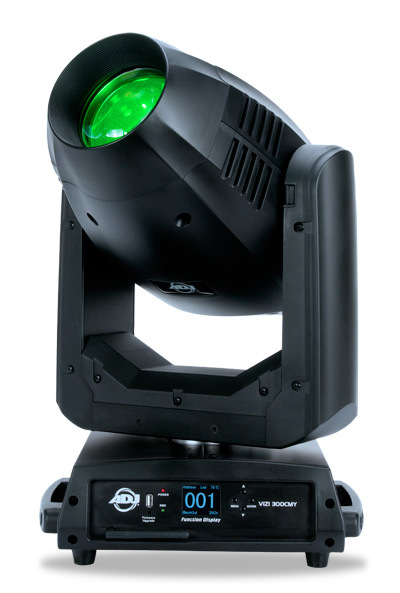 It combines a potent 300W LED light-source, extensive feature set and full CMY color mixing, making it ideal for a wide variety of professional applications including concert tours, theatre productions, festival stages and large church installations. With a specially-designed 300W LED engine, the Vizi CMY300 offers massive output that is suitable for use in large venues and on big stages. It is also a flexible fixture capable of operating interchangeably as a beam, spot or wash. This means that you can maximize your budget and reduce rigging times by purchasing just one fixture to achieve the same effects as three regular beam, spot and wash units. The signature feature of the Vizi CMY300 is its full CMY color mixing which gives you the freedom to select from a much wider palette of colors than a regular color wheel. Independent cyan, magenta and yellow color paddles – which allow variable intensities – can be mixed together to create almost any color imaginable. In addition, the fixture still incorporates a standard color wheel which allows easy selection of popular colors including UV. This also features a 3200K CTO filter, which allows the beam color temperature to be altered from the cool white of its LED light-source to a warm white that emulates older lamp-based fixtures. Two separate GOBO wheels allow the shaping of the fixture’s beam to create surface pattern projections and midair effects. GOBO Wheel 1 features 8 fixed patterns + open, including a beam reducer for use in Beam Mode. GOBO Wheel 2, meanwhile, offers 6 replaceable rotating pattern slots (Size: 26.8mm / Viewable: 20mm) and is supplied with 3 glass and 4 metal GOBOs. Motorized focus means that sharp GOBO projections can be achieved over varying distances and the fixture’s massive zoom range of 8 to 46-degrees allows for everything from super-tight beam projections to extremely wide color washes. Other useful features include a motorized Iris, with a range of 5-100%, as well as variable speed strobing and electronic dimming with fine dimming control. Giving you even more creative potential, the fixture is also fitted with two separate rotating prisms. The 3-facet circular and 6-facet linear prisms can each be used independently, but can also be layered together to create unique and complex projection effects. A professional-caliber fixture, the Vizi CMY300 supports an input voltage of 100-240V at 50/60Hz, which means that it is suitable for international use and therefore worldwide touring duties. It is also fitted with locking Seatronic powerCON input and output sockets, which allow the power for up to 4 fixtures (at 120V) and 8 fixtures (at 230V) to be daisy-chained together from a single mains socket. The fixture boasts a modular design which allows for straight-forward servicing and on-the-road repairs. Easy access to the inside of the head also makes for simple and quick GOBO replacements, while a built-in USB socket means that future firmware updates will be extremely easy to apply. This is facilitated by a large backlit full color display screen which also makes mode selection and DMX addressing very simple. Both 3-pin and 5-pin DMX sockets are provided, meaning that the Vizi CMY300 will easily integrate into any existing lighting setup, using a choice of 21, 24 or 26 control channels. It is also fitted with a built-in antenna for ADJ's WiFLY EXR wireless DMX system that transmits a signal up to 2,500 feet / 700M (line of sight). With measurements of 14.75” x 12.75” x 24.5” / 370 x 325 x 619mm, the Vizi CMY300 has a smaller footprint than most other moving heads in its class. It is also lightweight, considering its output and vast feature set, clocking in at just 51 lbs. / 23 kg. 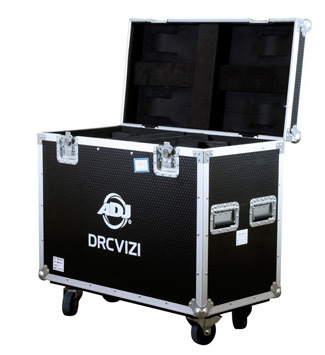 ADJ’s DRC16RX road case is the perfect size to store and transport a pair of Vizi CMY300 fixtures. This professional flight case has a 3/4-inch plywood base plate, aluminum edging, high-impact corners and casters, spring-loaded handles and 2-inch thick foam to protect the fixtures in transit and also make them easy to maneuver and store. ADJ is committed to pushing the boundaries of lighting technology while also delivering reliable and affordable products to our customers. The cutting edge Vizi CMY300 is a prime example of this. At an incredible price point for a fixture of its caliber, this powerful moving head offers a huge palette of colors, hybrid beam / spot / wash operation and an exhaustive collection of features making it the ideal choice if you’re looking for a versatile moving head for installation in a large venue or for use on largescale tours and events. The Vizi CMY300 will be available at the beginning of January 2018.